There are beginners and advanced classes: Sun. - Wed.
beautiful Campus in Har Nof. The Ulpan is free for an official Oleh Chadash during their first year of Ulpan. For second year students: 100 Dollars per month. 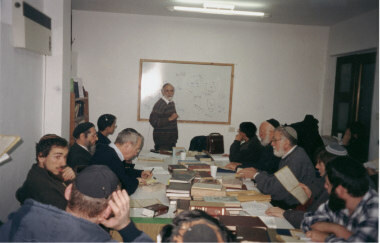 Olim from Har Nof area, and other parts of Jerusalem, also participate in the afternoon Ulpan. Israel, and some education field trips are in the Ulpan curriculum. You can join in the morning or evening program of the Jerusalem Academy- Yeshivat Dvar Yerushalayim. Knowledge of Hebrew gained in the Ulpan increases the ability to understand the Bible, the Talmud and the texts of Jewish tradition.